The Montreal Canadiens announced late Tuesday evening of the passing of Jean Béliveau at the age of 83. The Montreal Canadiens announced late Tuesday evening the passing of Jean Béliveau at the age of 83. A native of Trois-Rivières, Jean Béliveau was born on August 31, 1931. He played for the Victoriaville junior hockey Club and the Quebec Citadelles in the now defunct Quebec senior league. He then suited up for the Quebec As, before joining the Montreal Canadiens for his first NHL game on December 16, 1950 at the age of 19. Jean Béliveau’s glorious career of 20 seasons with the Montreal Canadiens, from 1950 to 1971, was highlighted by 10 Stanley Cup Championships, including five consecutive ones from 1956 to 1960. Béliveau still ranks second on the Canadiens all-time regular season scoring list (1,219 points), while being third for goals (507) and second in assists (712). He owns the Canadiens record with 176 career playoff points (79 goals, 97 assists), in 162 contests. Jean Béliveau was selected to the NHL All-Star team for 10 seasons, including in seven consecutive seasons, from 1954-55 to 1960-61, with six First All-Star team selections. He participated in 11 All-Star games, including in eight straight seasons (1953-54 to 1960-61), while being named the MVP in 1964. In 1956, Béliveau was awarded the Hart Trophy as the NHL Most Valuable Player and the Art Ross Trophy as the NHL leading points scorer. He was also awarded the Hart Trophy in 1964. During the 1965 playoffs he became the first recipient of the Conn-Smythe Trophy, awarded annually to the NHL playoffs MVP. Béliveau was the captain of the Canadiens from 1961 to 1971, the longest tenure in team history. The Canadiens won the Stanley Cup in five of those 10 seasons, including in Béliveau’s last season as a player. He added seven more Championship rings as a member of the Canadiens management team. A mere few months after announcing his retirement, his trademark number 4 was raised to the rafters of the Montreal Forum on October 9, 1971. The Hockey Hall of Fame waived its habitual three-year waiting period to immediately induct the Canadiens legend in June 1972. In 1985, as part of the celebrations of the Montreal Canadiens 75th Anniversary, hockey fans voted Jean Béliveau on the Canadiens all-time All-Star Team, along with Jacques Plante, Doug Harvey, Larry Robinson, Maurice Richard, Dickie Moore and Hector «Toe» Blake. Named grand officer of the Ordre national du Québec in 2010 (named knight in 1988 and officer in 2006), Jean Béliveau was awarded the highest distinction in Canada, the Companion of the Order of Canada, in 1998. Since 2005, the Jean Béliveau Trophy is awarded annually to the Canadiens player who best exemplifies leadership qualities in the community. 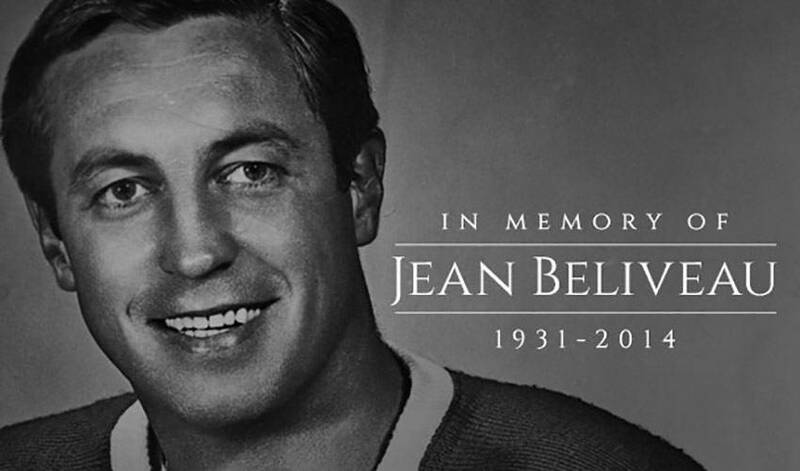 The players share their memories, condolences, and thoughts on social media following the passing of Jean Beliveau.